A day after losing a wallet, a San Luis Obispo resident lost a combined $20,000 from multiple bank accounts, according to SLOPD. Police are now searching for a suspected identity thief who made the cash withdrawals. On June 21, a San Luis Obispo resident’s wallet was stolen. The wallet contained several credit and debit cards, as well as identification cards and other personal information. 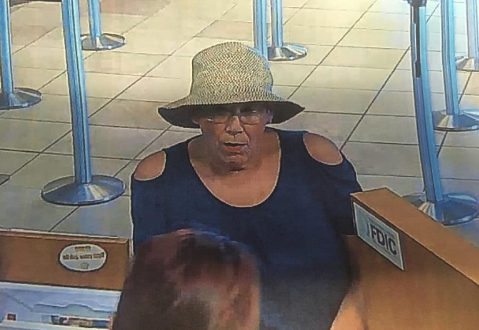 The following day, an unknown elderly suspect used the victim’s personal and financial information to make $10,000 withdrawals from two different banks in San Luis Obispo, police said. Police describe the suspect as a possibly female white adult who is about 5 foot 3 inches tall and 140 pounds. The suspect is believed to be about 65 years old. Investigators request that anyone who can help identify the woman pictured in the surveillance photo call the police department at (805) 781-7312 or Crime Stoppers at (805) 549-STOP. I say it’s a man too. So how did the thief get the money from banks as I have to show picture ID or account card with name to get money. Bank should of checked especially when you want to withdraw that much money. If they didn’t check they are to blame as well. Part of the reason crooks wear hats is because surveillance cameras are always posted high. They need to be mounted at eye level, at the teller window in order to get a good photo. That decision is up to the bank shareholders. It’s just a business decision, better quality cameras and better camera placement costs money and cuts into the shareholders dividend check. Screw catching the criminal or returning the money to the victim. The bank just writes off any loss at the end of the year anyway. They don’t care. “better camera placement costs money” wasn’t aware placing cameras above was cheaper than at eye level? Guess because the air is thinner up there and thus less resistance. I cannot tell from this picture but does the “woman” have an Adam’s apple? If so, it is not a woman. Also, do banks ask women to remove their hats? To me, this woman looks more like a man hiding his identity. Come on now it’s California, we should even being talking about this person gender until the person is able to tell us which gender they identify with. Everyone should be identified as gender neutral until we get permission from each person as to which gender to identify them as. Shame on that bank for allowing hats inside! SESLOC has a sign outside that says no hats and no sunglasses. This would have been easier to solve if everyone had that rule! Everyone DOES have this rule. I have only know them not to enforce it when they are familiar with the customer. In banks where I am not familiar, I have been asked to remove my cap.